Ahh, Wrexham, place of erm…..stuff. 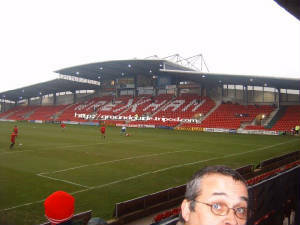 Back in 2002/3, I had little or no intention of going to the match at the Racecourse, however, after I had gotten into the habit of going to every game, it become inevitable and I was glad that I did as I generally liked the ground and there was a distinct element of comedy with their band playing 2 Unlimited songs. The journey was quite easy and getting into Wrexham seemed like a fairly easy entrance, however, as usual, there were a load of 12 year old chavs trying to wind us all up, it’s safe to say, they didn’t achieve there goal. 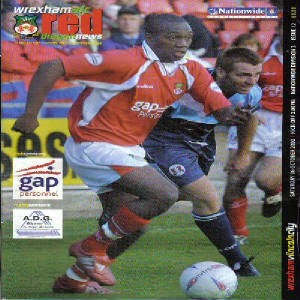 When we got to Wrexham the first time, I hadn’t bothered to research the prices properly so when I was told there weren’t any students, I panicked because I only had enough for what the student prices were, however, I did get in for a child (at the same turnstile as before just seconds afterwards). Nothing much had changed in the 3 and half years since our last visit and they were still letting in 30+ year olds as kids. So getting into the ground was a little unusual but hey, what you gonna do. I immediately went to the location I always try and get when going to away games (if the away end is behind the goal), sat at the top, near enough in the middle. So I went to that seat but looked out and couldn’t see half the pitch, the scoreboard was blocking the view so I trudged to the left and eventually settled for a position around ¼ of the way into the stand and if you can avoid a lot of people standing in front of you, this offers a fantastic view of the action. The away end was fairly large and looked like it could hold around the 3000 mark and other than the view obstruction from one or two posts and the aforementioned scoreboard; it was a really good stand with a great view. The stand to our right was the stand I had seen the photo, it was a pitch length stand, roughly the same height as the CO-OP and was a very nice stand. What makes this stand, stand out from most others is the unusual roof. It’s hard to describe but if you picture a dome like angled roof, with the middle section raised above the rest, then you get that stand. 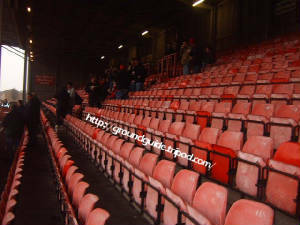 The stand to our left was a fairly large seated stand. I can’t really remember the quality of this stand. 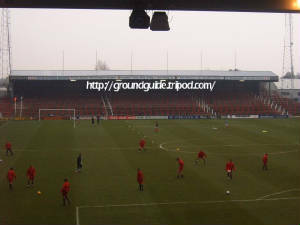 The final stand, behind the opposite goal was a large terrace, roughly the same size as the away end. The last time I had gone to Wrexham, there had been a band in the main stand that played completely random songs that had nothing to do with football, mainly "No Limits" by the early-mid 90's techno group, 2 Unlimited, but this made for a special day out and I was disappointed to see this had disappointed and there was virtually no atmosphere at all, it was like going to Boston all over again. 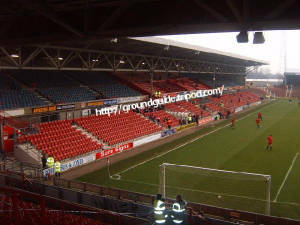 Overall, I actually like Wrexham’s ground but the lack of atmosphere lets it down. Oh well, what do you expect, atmosphere and Welsh teams aint known for matching. I would recommend this ground to a person who wants to do a random game, however, don't expect anything out of the ordinary and the only major plus point for the ground, is the unusually shaped roof on the main stand.